When you start riding you do not want to buy all of the equipment yourself, before you even know if you are going to carry on. You may not like riding or you could find it too time consuming. So, to avoid a big initial outlay of expense in the way of equipment, most schools will lend the most important pieces to you. From the horse down to the gloves, if you need it, they will generally be able to find it. For beginners, much of the amount of riding clothing they will eventually need is simply not necessary right at the start, so they should not even worry about borrowing it, let alone buying it. Beginners just need to wear sensible footwear and comfortable clothing, preferably not jeans and trainers as jeans can become uncomfortable when wet and can hinder movement and trainers have no heel to grip the stirrups. There are not many riding schools who would expect a complete beginner to wear jodhpurs and the rest of the kit which more experienced riders wear. But the one thing no riding school worth its salt will let you ride without is a hard hat. In fact, if they are prepared to let you ride without a riding hat, you probably should not ride there. You should really buy your own hat as soon as possible because you can never really know what has happened to an old one that you are borrowing. Riding schools are usually very diligent about them, and will throw them away if they have been involved in a fall, even if there is no visible damage. But if you do borrow a hat, make sure you do check it for signs of wear and any damage. If there is even the slightest damage then do not use it. Also make sure it fits properly. Get the instructor or someone who knows how it should fit to help you put it on.All of these measures apply to body protectors too if you are going to wear one. You don’t always have to wear one but they are a good idea – especially when you start to get more advanced in your riding. The same checking rules apply to protectors as to hats. Unless you bring your own horse with you to lessons, schools will not usually expect you to have your own tack to ride a borrowed horse or pony. 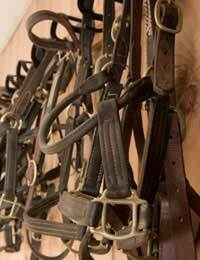 Usually, the horses which you ride will have their own set of tack which you will borrow along with horse. However, you will be expected to put the tack on and take it off yourself, and clean it, although maybe not on your first lesson. In a similar way to tack, the school will lend all of these to you, as again, each horse will come with his own set of grooming brushes, own brooms for mucking out and so on. Again, once you have had a few lessons, the school will teach you how to groom your horse and muck out his stable so that you can do it yourself and even work towards a stable management qualification. Riding schools usually have huge amounts of equipment for you to borrow so you will always find something which suits you and, importantly, fits. You cannot borrow things indefinitely though, so when you have made up your mind that you are going to pursue riding, you should start building up your own collection. Start with the smaller pieces and build up to bigger ones. Obviously, at any time that you do decide to buy your own horse, then a lot of the tack and other equipment will have to be bought as well. But if you already have all your own clothing and maybe items such as grooming brushes, this will seem a more manageable outlay.